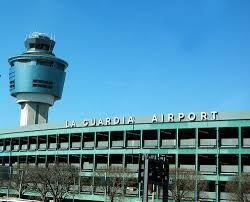 I recently had the pleasure of a lengthy flight delay at LaGuardia airport. Pleasure you say? How’s that possible? Nobody enjoys layovers. Well this particular extended stay at the food court was actually enjoyable. We staked out a spot near a recharging outlet and settled in for what threatened to be a long boring delay. There was an open area directly behind me where two people were setting up for what looked like some sort of children’s event. There was candy, a roll out hopscotch board, and a small garbage can placed directly behind my seat. I didn’t think twice about it other than to prepare myself for a bunch of noise. A few minutes later I was hit by a paper airplane. (That plane didn ’t have a layover!) When I turned around to see where it came from I was surprised to see an apologetic airport employee. She had missed in her attempt to throw the plane (which she had made) into the garbage pail. But she was encouraged by one of the organizers who pointed out that she still had 3 more of her 5 chances left. If she made it she’d get an extra raffle ticket. Later she played a very poor imitation of hopscotch and laughed hysterically as she fell over. This was followed by a more successful effort at Red light – Green light which she chose over Simon Sez. All the time she was playing, other employees were laughing with/at her. New people were arriving while other employees returned to work when their breaks were over. Instead of taking their break at the coffee machine or water cooler, employees from throughout the airport could share a little entertainment and excitement during their 15 minutes. The organizers were always encouraging and boisterous. Everyone took their turns to earn additional raffle tickets and candy. Grown adults were acting like children and really enjoying it. Later that day the raffle promised 3 lucky winners some relatively small monetary prizes. WHAT A GREAT IDEA!! For a few hundred dollars almost everyone felt better about working during this rainy, flight-delayed hump day in New York City. If they can do it on what otherwise would have surely been another miserable day at work why can’t you? The large split shift between morning delivery and afternoon returns would be a perfect time for most transportation operations to create a “game day.” Many vendors would be glad to donate some small prizes like gift cards. I bet you could convince a supervisor, manager, or HR person to donate a few hours of their time to run the event. Better yet, step out of your comfort zone and be the leader yourself. Don’t stop there. Create and play your own games like our dispatchers do when they play bus driver bingo. First they distribute bingo cards in all driver message boxes. Then each morning and afternoon they draw two numbers which they post for everyone to see. There’s an abundance of research which shows that happy employees provide better customer service and have better attendance. They probably live longer too. We spend more of our time at work than anywhere else. Why not make it a little more fun? Posted on August 26, 2013, in Best Practices and tagged Airports, Business, Fun, Ideas, leadership. Bookmark the permalink. 1 Comment.